Upon completion of the new St. John’s Church in the 1890’s, a Roosevelt organ was installed in the chancel organ chamber. The Roosevelt Organ Company was a first-class organ builder in its day and installed many instruments in major churches throughout the East. Many of our organ pipes today are descendants of the original Roosevelt pipes, revoiced to blend with the additional pipes purchased to enlarge our present organ to its 116 ranks. 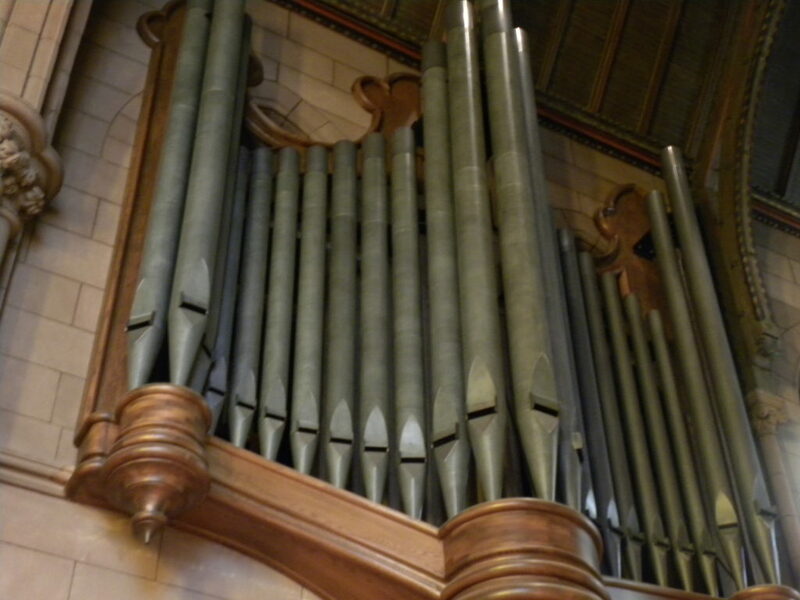 In 1917 St. John’s Parish engaged the E. M. Skinner Company to install a new organ in the chancel organ chamber. While not a huge instrument, this Skinner organ was of a respectable size, played from a four-manual console on the south side of the choir. The organ remained virtually unchanged until 1960, when it was felt to be “too romantic”or “too thick.”The organ was substantially modified by the addition of substitute stops to brighten the sound. The old console, now essentially worn out, was replaced. At the same time, the McManus Company of Kansas City installed the organ in the gallery; this organ was intended to support congregational singing, (inadequate support for the congregation had become a constant problem after the installation of ceiling tiles in the nave.) This organ was designed as a Germanic organ, to sound clearly down the nave, without interference. Eventually some water damage required the removal of some pipes, and at the same time the organ was tonally revised to “quiet it down”. Unfortunately, the organ then lost most of its character and largely became a supplement to the chancel organ. During the last ten years, it became increasingly obvious to the Parish that the chancel organ was deteriorating. The leathers were giving out, the wood of the wind chests was rotting, air was leaking, and ciphers (air escaping through the pipes creating many loud and random sounds) were frequent. The last major cipher occurred at the Christmas Eve service in 1989 during a substantial cold spell, an announcement to all that the organ project had to be faced. Since the installation of the E. M. Skinner organ, several fashions in organ building had come and gone. 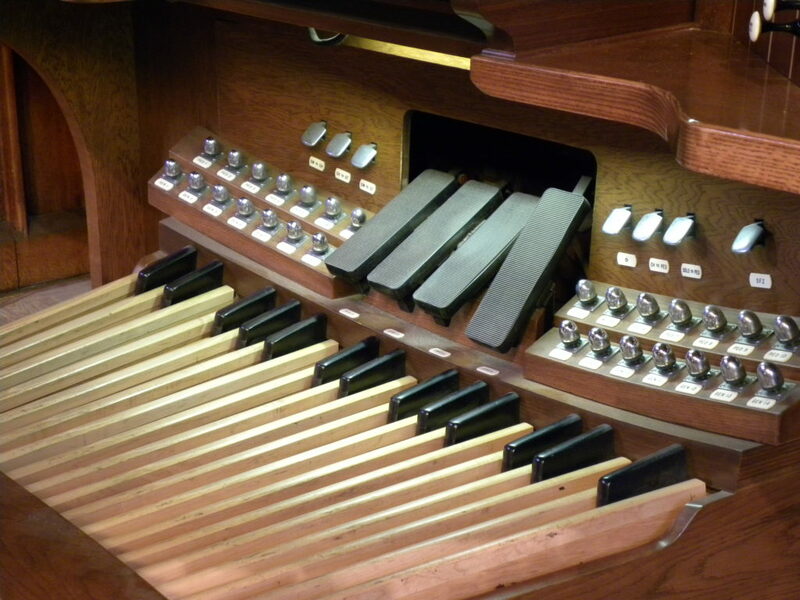 The old romantic, orchestral instruments were felt to be heavy, tubby, and unsuitable for the playing of the classical organ literature: Bach, Buxtehude, and the other great 17th and 18th century composers. Organ builders had come to favor the bright sounds and exposed pipes of the great builders of an earlier age. The electro-pneumatic action perfected by Skinner was discarded in favor of a mechanical action, which players felt gave them more control over the air flowing into the pipes. The pendulum has now swung back toward the middle of the road, and a number of classic American organs have endured and have gained respectability as instruments capable of playing music of all periods, from the 16th century to romantic and modern works. 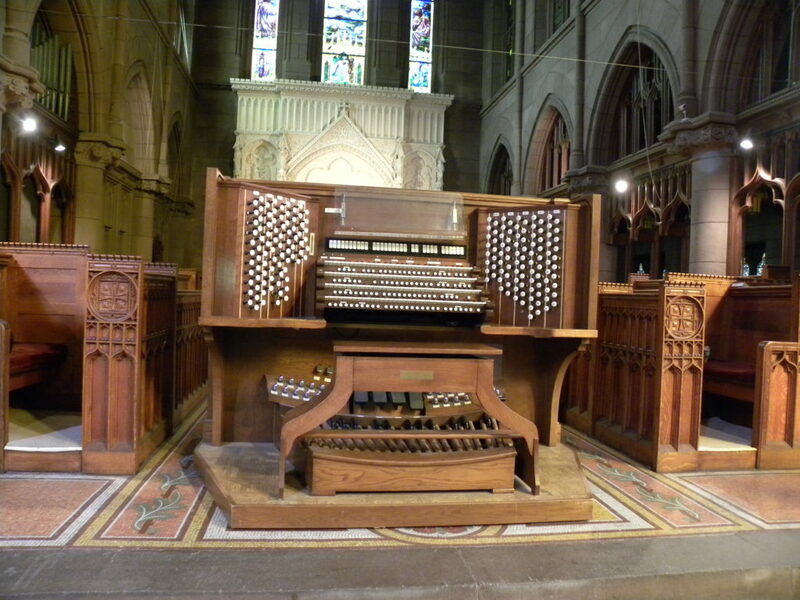 The rebuilding and enlargement of the organ at Saint John’s Parish has been undertaken to provide such an instrument. After much deliberation, Saint John’s organ committee decided to rebuild our current instrument, engaging Bruce Shultz of Philadelphia to develop a tonal concept, to guide us in the renovation, and to provide the final tonal finishing. 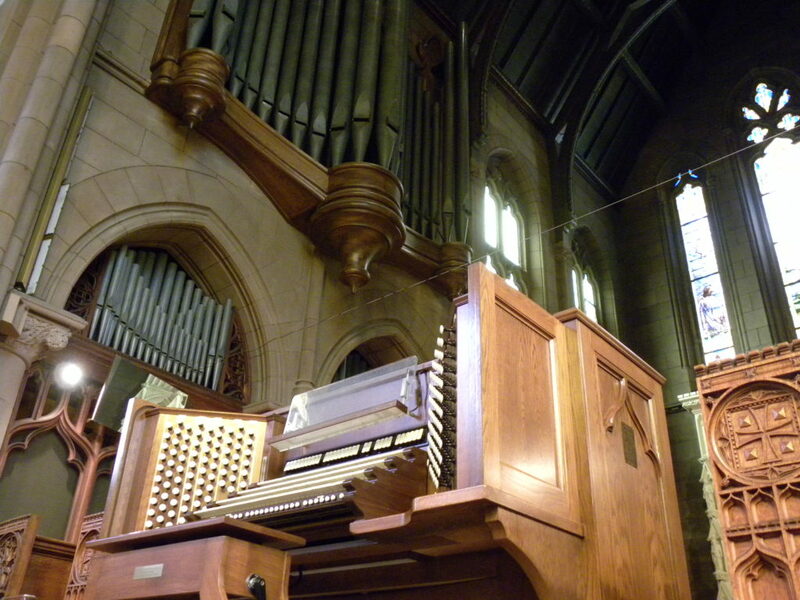 In a unique venture in organ building, Saint John’s contracted for all services separately: pipe work, woodworking and case, mechanics and internal design, console, and so on. The development and management of such a project is no easy task–someone has to manage the entire affair from day to day! In Saint John’s case, that someone was a combination of our own Curtis Pierce, Organist-Choirmaster, and Craig Ferguson, a lifelong member of the parish and organ enthusiast. Saint John’s has chosen to rebuild and enlarge an American Classic Organ, and to call upon one of the few voicers still upholding the tradition brought to perfection by the late G. Donald Harrison, of the Aeolian/Skinner Organ Company. The 1917 Ernest Skinner organ and the revisions made in 1960 consisted of approximately 3,000 pipes. Those 3,000 pipes have been included in the rebuilt chancel organ, along with new chests, wiring, electronics, console, etc.. Most of our existing pipes have been revoiced to blend with the 3,000 additional pipes purchased to enlarge the organ to approximately 100 stops. In this 1991 renovation, much of the character of our original Skinner instrument has been preserved. At the same time, the organ has been enlarged to better support our worship needs and our music program. We hope that were Mr. Harrison still alive, he would be proud of our installation and would feel that the Saint John’s Parish organ is truly an American classic. 1981 saw Bruce Shultz of Philadelphia, organist extraordinaire, organ builder, and teacher, vying for the purchase of the Skinner Organ at Peabody Conservatory. Saint John’s was interested, too, and as fate would have it Shultz was the victor. Ten years later we remembered this tonal genius, and invited him back to Saint John’s to share ideas with us on a rebuild. Immediately, we felt the synergy, and the project was underway. Two key elements were in place: Bruce Shultz, the designer, master voicer, and finisher, and Foley-Baker, the mechanical experts. Following on their heels came Organ Supply Industries for windchests, pipes, reservoirs and console; Trivo Pipemakers for the reed pipes; Solid State Logic for the electronics; Luellen Fields, for architectural direction, who with Rink DuPont designed the organ case; A. V. Tuchy, whose careful rigging and scaffolding raised the case; ICMI who supplied the electronic bass notes; and finally the Leppart Nutmeg Company, who rescued us from disaster when the 1917 main wind supply motor burned out (two weeks before the dedicatory recital!). Saint John’s has acted as “general contractors” through Curtis Pierce, then Organist-Choirmaster, and Craig Ferguson, then Parishioner and Vestryman. The enthusiasm for the two-year project was shared by suppliers, artists, workers and especially Saint John’s own parishioners. Saint John’s now has an American Classic in the style of the organ at The Cathedral Church of St. John the Divine in New York City- a complete and versatile instrument to enhance its magnificent setting.